Franciscus Curtus. Ad vivium exprimebat. Bononiensis: ca. 1640. The anemone from the 1640 edition of Curtus's Ad vivium exprimebat was adapted for use in Merian's 1730 De Europischen insecten (a translation of Der raupen wunderbare verwandelung und sonderbare blumennahrung, 1679-83). 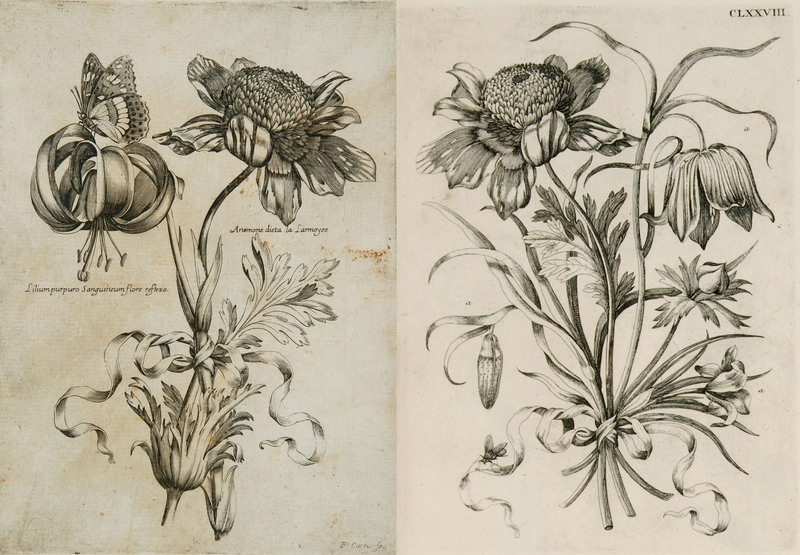 The Merian version of the anemone is close to a mirror image. Elsewhere in the engraving, note the change in insects. While Curtus shows a butterfly on the left-hand lily, Merian has placed a small fly -- or perhaps a mosquito -- on the ribbon tying together her bouquet.